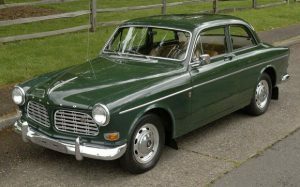 Hitchhiking home from work, Izzy spots a 1967 Volvo 122s with an “I Flick Butts” bumper sticker. At the next red light, he gets out of the car that’s given him a ride and approaches the young woman smoking a cigarette in her Volvo. The red brake lights flared at the ends of the Volvo’s tail feathers and she stopped a little suddenly. We were still rolling when I bolted from the car and ran to the passenger-side door of the Volvo. I leaned my forearms on the window hole in the door. The Troggs were in her car too. She was pretty, a few years into her 20s, having a nice late afternoon, enjoying her smoke, not particularly fazed to have me looking in her window like one of the principal characters in The Wizard of Oz, who show up year after year at the end of the movie to greet Dorothy as she awakens. She was looking at me, smiling faintly and unalarmed. “Hi,” she answered. She smiled wider and blew a plume of smoke out the side of her mouth, away from my direction, tapping the cigarette out the window. “Some guy gave it to me for throwing my cigarette into the street.” Like it was a prize. There was a pullout ashtray in the middle of the dashboard, but it was closed shut. She did a double-take, looking at me again, trying to figure out how we knew each other. I smiled at her, a bookmark my father had laid down in the currents of smoking automobilists. Looking at him through a stranger’s reflection, I loved him as much as I ever had. “I told him the truth. There is an ashtray in this car, but there’s no cigarette lighter. So I don’t use the ashtray. I always throw my butts out the window.” To make sure I understood, she then threw her cigarette out the window. “Exactly.” Without looking, I could tell the light was going green and I backed away from the window in the passenger-side door. She turned away from me then, refocused on the traffic and the rest of the driving-and-smoking life ahead of her. The Volvo pulled out of the intersection, spinning down the road all Nordic cool, unapologetic for being un-American.